As promised, I’ve just drawn the two winners for the online registration for the Fat Studies: Identity, Agency, Embodiment conference! I will be in touch with you both shortly to arrange your online registration. Congratulations! For the rest of you who are interested, you can still get online registration here for the conference. It’s a bargain at $50NZ, you get access to all of the presentations via both livestream and on demand. It’s the next best thing to being there in person! Get on it, it’s gonna be awesome! Well hello! It’s all happening here – thanks to those of you who donated, promoted and shared my GoFundMe campaign, I raised a neat $2000 to get me to New Zealand to present my paper at the 2016 Fat Studies: Identity, Agency Embodiment Conference next month. I am SO excited about being able to attend and present this year, I did so four years ago at the first conference, and it was one of the best experiences of my life. 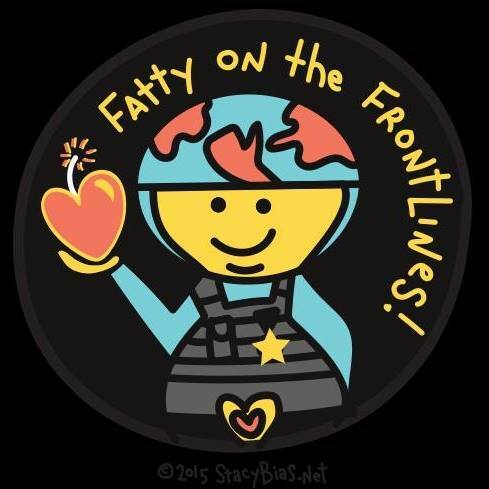 Not only to go and be amongst scholarly thinking about fat but also to be amongst a community of fat people and allies. I am also completely gobsmacked at just how generous and supportive so many people have been in getting me there. It’s been a big couple of months for me, as well as all of this, my Grandad passed away, and I’m working on a really big project with my day job, and having so much support and encouragement for my activism has really help shore me up in an otherwise intense time in my life. So to all of you who contributed in whatever way, thank you so much. Now, on to the meaty stuff of this post! One of the awesome things about this upcoming conference is that for those who are unable to travel to New Zealand, there will is an online registration available. This gives you access to both live stream and view on demand professional video recordings of the event (including each of the presentations) and the conference programme. It’s a bargain at $50NZ and you can get it here. Also, I’ve got two online registrations to give away! So two of my lucky readers will be signed up for online registration, and get to enjoy the conference and all the on demand videos! How cool is that? And look at what you get to enjoy! Keynote speakers Katie LeBesco and Substantia Jones. And two days full of speakers like Jenny Lee, Amy Farrel, Xavier Watson, Hannele Harjunen and Cat Pausé of course! Oh, and me! What one thing would make you feel liberated as a fat person? There is no correct/winning answer, I just want to know what liberation looks like to all of you (and it helps me weed out the trolls). It could be anything, what matters to you is different to what matters to the next person, though I daresay we probably share a lot of them! Here, I’ll even give you some help, here’s my answer. I’d feel really liberated as a fat person if I could exist in the world without the constant surveillance I am subjected to. Without people staring, ogling my food choices and grocery shopping, sneaking photos of me in public, nudging each other to point me out and poring over my online presence out of some perverse need to watch me at all times. It would be so freeing to not have to deal with that every day. So there you go. Good luck and I can’t wait for the conference to happen so that I can tell you all about it.